If you're like me, your Phoenix Props / 7 Chambers "Ultimate Hero" box showed up in the mail and as you unboxed it you suddenly felt a mix of emotions. As they publicly acknowledged the ribs were all wrong. We're all hoping that will get remedied and second time will be the charm when our replacement rib/grenade sections arrive. But you will also have noticed some other problems with this "ultimate" canon hilt. It's got some small items that make it very much not canon. 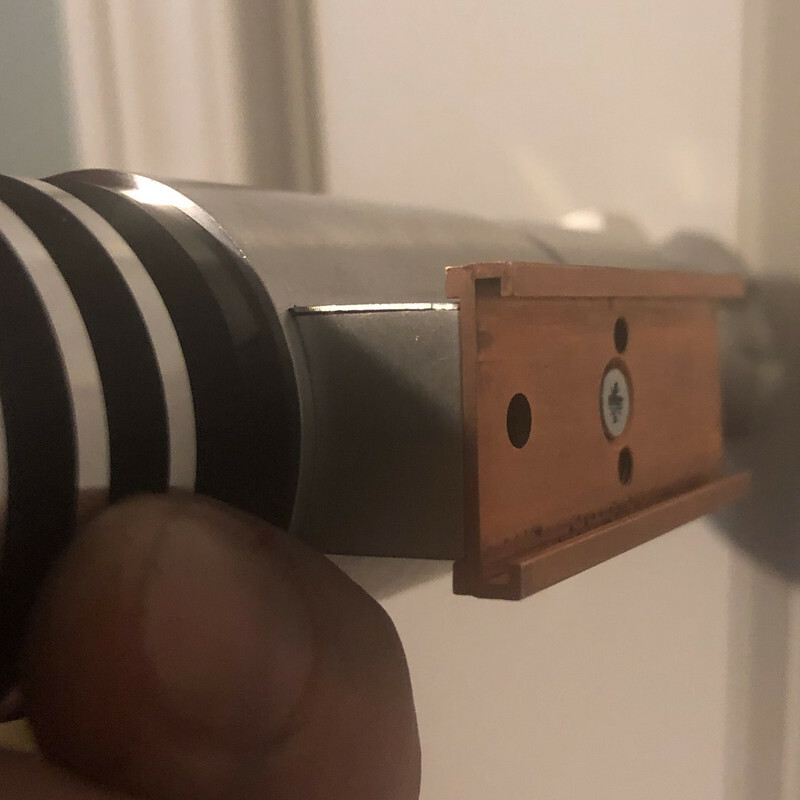 This comprehensive guide will attempt to walk you through all the steps, materials and tools needed to transform your new hilt into an ACTUAL CANON hilt. First let's clear some items up. For Hero hilts in Return or the Jedi, there are essentially two variants in question. These are colloquially referred to as the "I See You Have Constructed A New Lightsaber" (or ISYHCANL) version, which is named after the scene on the moon of Endor where Darth Vader inspects Luke's newly constructed lightsaber and remarks how his Jedi skills are complete; and the "Cave Build" version which refers to a deleted scene where Luke finishes assembly and fires his lightsaber up for the first time. These two variants are the main variants of the Hero hilt (which incidentally is but one of a few hilts used in the movie; the most common of which is known as the "V2", but I digress). Phoenix Props / 7 Chambers targeted the "Cave Build" of the Hero in their run, so we will be focusing this guide on that variant of the Hero hilt as a baseline. 1.) The ribs... obviously. (We're gonna ignore this for now since Phoenix Props / 7 Chambers has stated they are rectifying this. I will revisit this in the guide if the replacements are still wrong when we get them. (Or I may just use the one originally sent as a guinea pig). 2.) 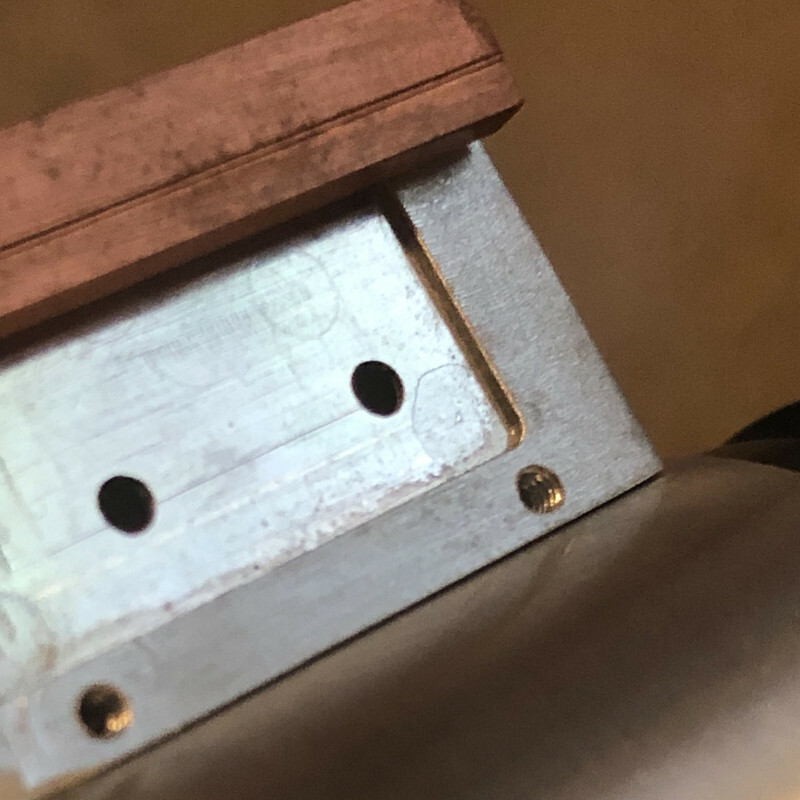 the triangle faceplate was polished incorrectly and the reverse side is polished which does not orient the holes correctly. With the holes oriented correctly the finish facing out is the raw machine marks. This needs to be cleaned up. 3.) 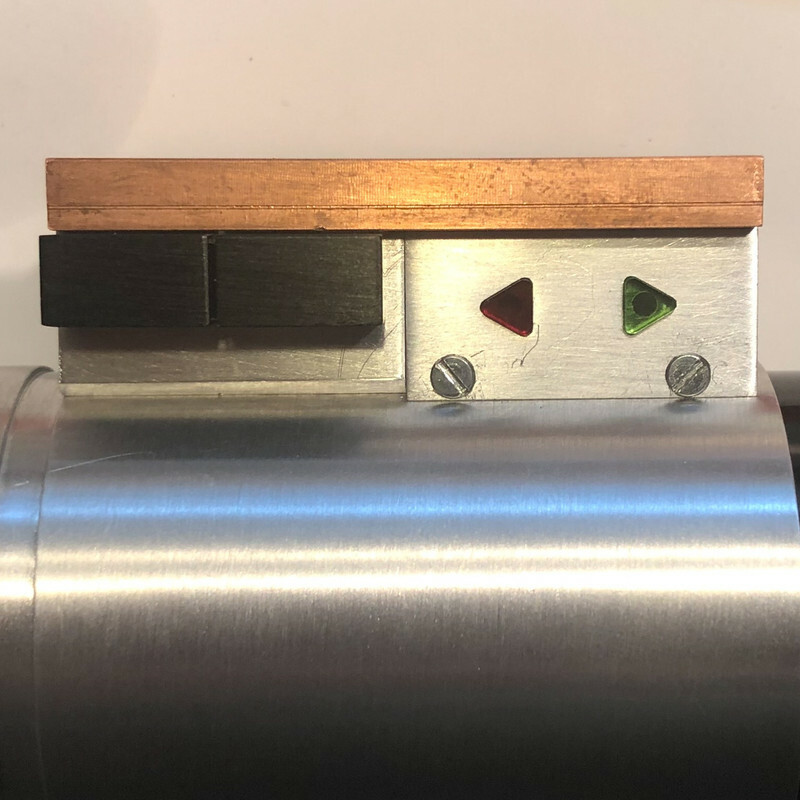 the control box is not chamfered to enough of a degree (only the slightest hint of a chamfer was on the production run and it does not come up high enough). 4.) the control box triangle faceplate holes are 0.5mm too small in diameter (they are 2mm and should be 2.5mm). This is a tiny difference but does matter. 5.) 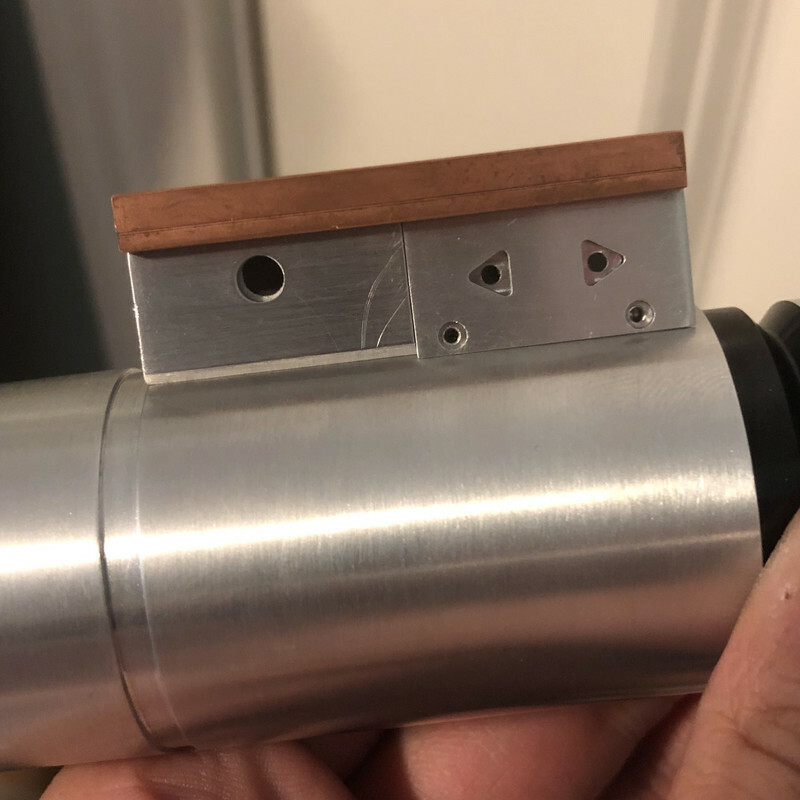 not technically a canon issue; but the triangle faceplate must be affixed with glue and the slotted screws glued into the holes because the holes are not threaded and the screw posts are too small to bite. But this is a pretty icky way to affix the plate. So we're going to address this in this guide. 6.) the triangles have small rounded points instead of being crisp points. (This will require you have a way to make new triangles or a supplier begins doing "more canon" triangles for this hilt. 7.) the copper plate has technically two levels of overhang but this is not pronounced and the lower area of overhang needs to be painted. If you notice more, feel free to comment and I'll edit this guide to cover these items. Also special thanks to brrogers for helping with brainstorming the issues and fixes and finding an acceptable paint color for the copper plate overhang. Scotchbrite pad or steel wool. Estimated maximum time for this fix: 1 hour. EWW, right? Thankfully this is a pretty easy fix if you know anything about polishing. But let's walk through it. Taking the side that has the holes oriented correctly but the raw machine marks, you will want to sand by setting to work parallel to the long edge by hand with 220 grit until the machine marks (which seem to run parallel to the short edge) are gone and you have uniform 220 grit scratches. Then run 600-grit perpendicular to that (running parallel to the short edge) until the 220 grit marks are gone and you are left with vertical 600 grit marks. Then perpendicular with 1500 until smooth and just the faintest hint of horizontal marks along the long edge. Now this is TOO mirror but eliminates any and all marks you don't want. Then take a scotchbright pad and work along the long edge to layer the faintest hint of roughness over the 1500. This perfectly mimics the finish on the rest of the hilt. Also file a bit carefully on both long edges (top and bottom of plate) to get a flush fit if your faceplate doesn't sit flush against the box when it is on the hilt (mine had this problem as well). The bottom edge done at an angle to mimic the radius of the body. I personally did very small increments and checked fit frequently. Now some could argue this is a minor detail and maybe not even one people would want. Since it sort of breaks the normal lines of the control box. But... we're going for canon right? Well... this is canon. The back half of the control box (behind the faceplate) does not terminate in a crisp corner but instead has a chamfer or bevel in the corner. 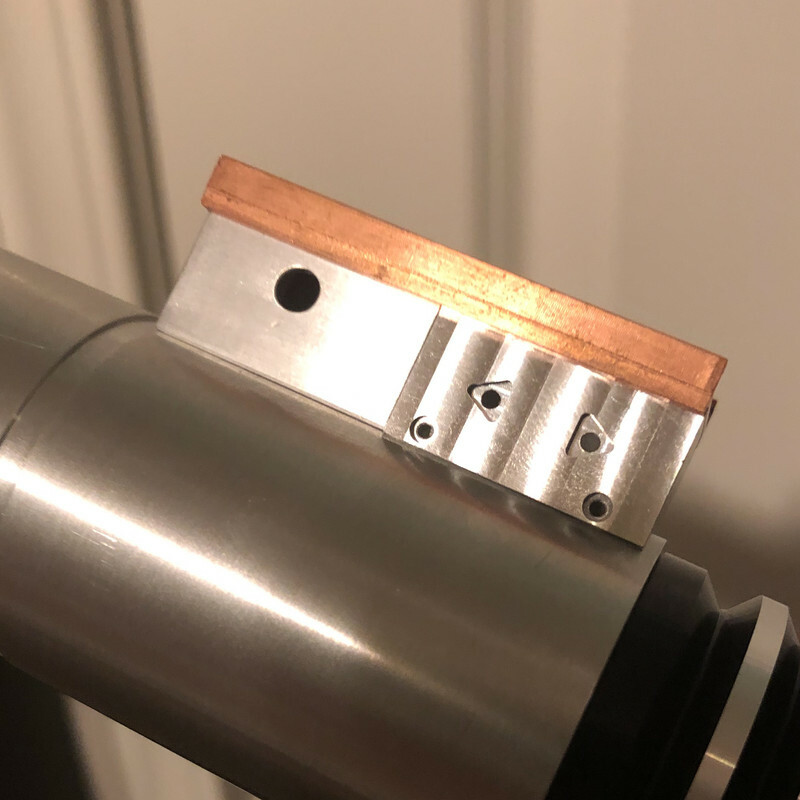 As you can see in the picture above, the termination of the box goes almost right up to the body tube and the chamfer that is there is too small. This is not correct if you look closely at the original prop. So, we need to put a larger chamfer in it. Sandpaper grits as in the above step. (Optionally if you have a mill, you can make this step stupid fast with the endmill like brrogers did, but I am trying to keep this to simple everyday tools or readily accessible ones most people have or can easily get). As mentioned, on close inspection there is the faintest hint of a chamfer in the production part which gives you a good reference to angle with. You will use this as a guide and follow the same plane as what is there just make it bigger. You're gonna just file this sucker down more, paying attention to try and avoid the area where the plate will go, and stick to the back half. You could do the whole edge but then we'll have a problem with the screws later so let's not do that. There you have it! One step closer to canon! We're going to address two issues in this step. We're going to give the faceplate screws larger diameter (~2.5mm vs 2mm) and at the same time we're going to make it so the faceplate actually is held by screws instead of this superglue nonsense. M1.6 countersunk flat head slotted machine screws (you can pick any length and trim, or get 2mm) depending on which method below you want to use. the control box screw holes are 1.3mm in diameter which is larger than the posts for the provided screws (which appear to be m1). The heads of these screws also do not grip the faceplate and so need to be larger. There are two methods here, one involving shorter screws and mods to only the control box, and method two (provided by brrogers) that involves drilling all the way into the body tube, allowing longer screws. Both methods are covered so choose your own adventure as follows! With a 1.3mm diameter hole, this is very well suited for m1.6 screws. Taking the m1.6 tap VERY CAREFULLY tap the holes in the control box. Don't force it too deep beyond the bottom of the hole or you are going to blow out into the radiused bottom of the control box. 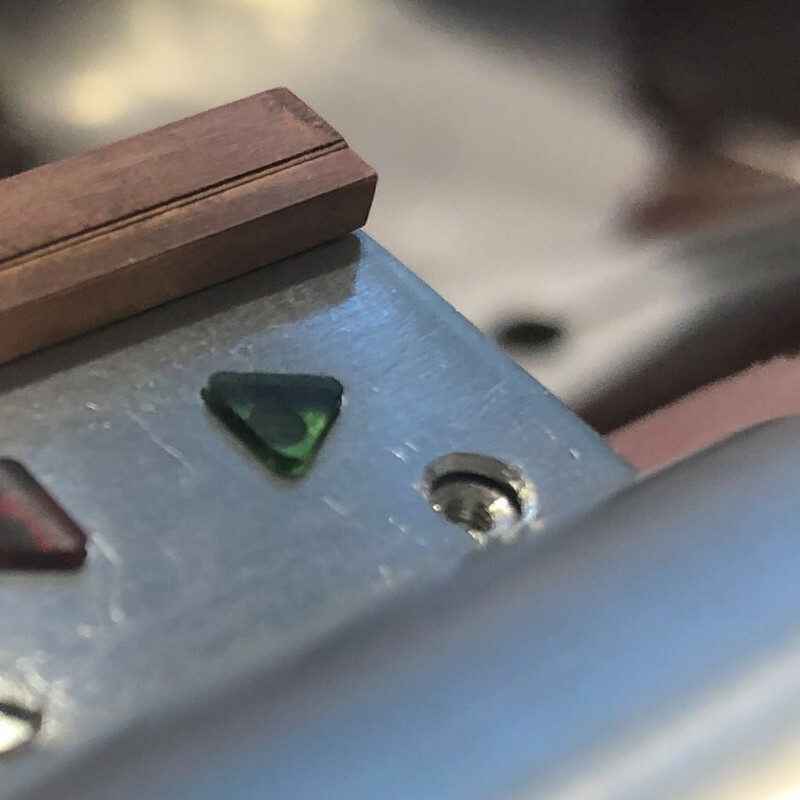 The depth here is around 2mm tops (including accounting for the thickness of the faceplate) so you should start to feel more resistance on the tap pretty quickly. Back it back out carefully. The aluminum is strong enough to hold the plate and there is enough depth for the screws but aluminum IS soft and it's easy to mess up the tapping on this. Go slow and be cautious. For this method you're going to need roughly 2mm length on your m1.6 machine screws for method 1. I found 2mm length ones from Accu and even these MAY require a tiny bit of trimming with a file. But lots of places that carry m1.6 machine screws. Feel free to shop around. I've linked the ones I got for your convenience. If you get longer ones you can always file the posts down to trim though be careful not to mar the threads. Amazon has some 4mm ones for super cheap but will require trimming (or doing method 2 below). Now that you have the box itself threaded you need to ream the holes on the faceplate to allow for the countersunk head of the screws. This is where the 7/32" drill bit comes in. I recommend using the tap holder or a manual micro hand drill for this. Do not use a power drill because you are not going to have enough control. Place the drill tip into each hole and begin turning the drill so you begin shaving material off the rim of the faceplate holes. Go slow and check frequently. This is tricky because you want enough depth to allow the screws to seat (and this is how you can also control the clocking so the slots appear in the canon position), but not so deep to cause the heads to drop to a lower level and/or remove too much material and the screws don't have enough surface to grip the plate. This is probably one of the most meticulous steps in the process. Check your screws often especially if you are trying to clock them too! Now of course you have to get the screws in. If you are using method one, this is tricky since the posts are so very short! Method 2 is easier to get them in there but involves drilling into the body, so it's your call. Thanks for cluing me in! Here is a preview of my personal work in progress with the hilt! And it is fantastic indeed! This shows everyone what their Ultimate Heroes can look like if they follow this guide! This is looking really good. Do you have the updated grip section already? It looks to be a better thickness than the one I have. No I’ll be waiting on that too. 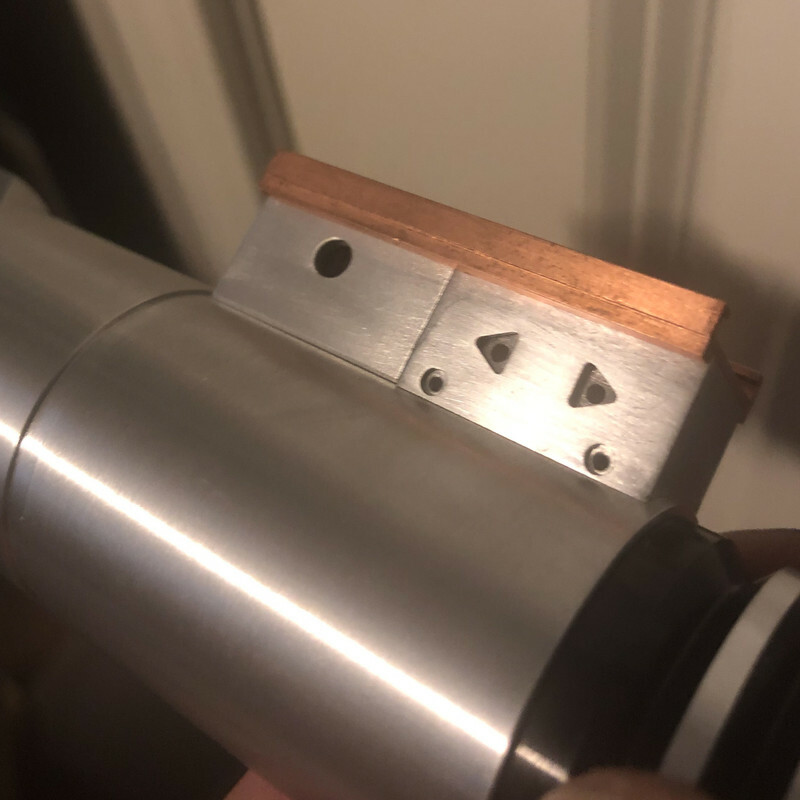 In lieu of having a metal lathe l I chucked the saber into a 3-jaw chuck that I have for the end mill and ground the rings down. since we are going to be getting new sections I may in fact use the lathe and turn down the rings on the one originally shipped. For the guide tho I am assuming (benefit of the doubt) that we'll get corrected ones, and that they will triple check them this time. However, I do have a lathe and could use the first one shipped as an example for the tutorial. brrogers, did you modify the angle of the grooves or just sort of create a tiny ledge to make the ribs more narrow? Can you also confirm your rib measurements? The groove depth should go from the 34mm outer diameter of the rings to 27mm at the valley. The grooves should be 5mm wide. How does this align to your current hilt, brrogers? Although for this operation I basically used a side by side comparison on my phone, scaled to 1:1 as best as possible. This is where a metal lathe would be really nice: but I then used a scotchbrite pad with an angle grinder, and with the pommel chucked into a 3-jaw chuck on the endmill basically just tapered the ribs in, making the flats as close to the reference as I can. Got it. So essentially you widened the angle of the grooves to thin the rings. Got it. Final measurements would be SUPER helpful when you get a chance. Since yours does match the original very closely, having empirical confirmed measurements would be helpful. I suspect they line up closely to what I stated above but would love to have your caliper readings for each rib! Round of applause for dayadjocen seriously. Just trying to help the PP buyers like me! 😁 but thanks man! I really appreciate the support. I want folks to have hope. The PP DOES have potential. Just a tweak here and there... it has promise. And it gives me good fodder for a Dagobah post! What did you do about the black finish then, did you just re-spray? Because for me it would be easy to use my lathe to thin them up a bit but would be a big pain to then re-paint the material, as normal paint is going to look pretty sub-par, and I don't have a way to PC or anodize. I would powdercoat or anodize if I could too, but in this case I used a Krylon primer+satin black spraypaint after re-shaping the grenade. After sanding the grenade ribs and using an acrylic paint on the copper windvane for accurate color, I coated everything in the rustoleum matte clear. That looks about identical! I do notice however, that maybe the m1.6 screw heads might be too large after all? When you get the calipers for measuring your ribs can you get your screw head diameters too? Those look closer to 3mm vs 2.5? Your pic is awesome because it IS so identical it becomes a valuable item to confirm canon measurements. Also makes me realize that Phoenix may have that groove behind the control box on the body about 1mm too wide too. OP updated with some additional screw findings. I am working to get precise length requirements but looks like it method 1 for threading is used, you want m1.6 slotted countersunk screws at 2mm length. (Method 1 being only control box mods and not drilling into the body tube). OP also updated with link to purchase these. Control box threading (method 1) is complete. I know you were interested in this bit. Heya, so here is the pertinent info you're looking for: And I think I've confirmed beyond a reasonable doubt that the PP/7Ch is scaled down too far. Sorry for the chicken scratch. What I did was take that reference into photoshop then size it accurately (relative) to the PP/7Ch in hand. Printing it out, it gives me something to compare quickly and note down. What this shows me, beyond a reasonable doubt... is that although my modification of the rings makes it pretty dang close there are some other areas that are frustratingly different and can't be changed. These are most obvious with most aspects of the control box, where the PP/7Ch is longer by 1mm. This is reflected in what you said about the sizing. As well as in the variance of the arrow plates' screw position being too long. The black switches and rail sizing are actually spot on oddly enough. I think the selection of the 1.6 screws account for the spacing issue there; closing the gaps between the arrows although relatively speaking they're too big. They are actually 2.8mm dia. by the way. The recessed ring in between the pommel and control box section is 1mm too long. Obviously, the blade plug sits does not sit flush. What I've discovered is that its overall length appears correct, but the face was machined 1mm more than it should have been to sit properly on the face of the emitter. That's a bummer. 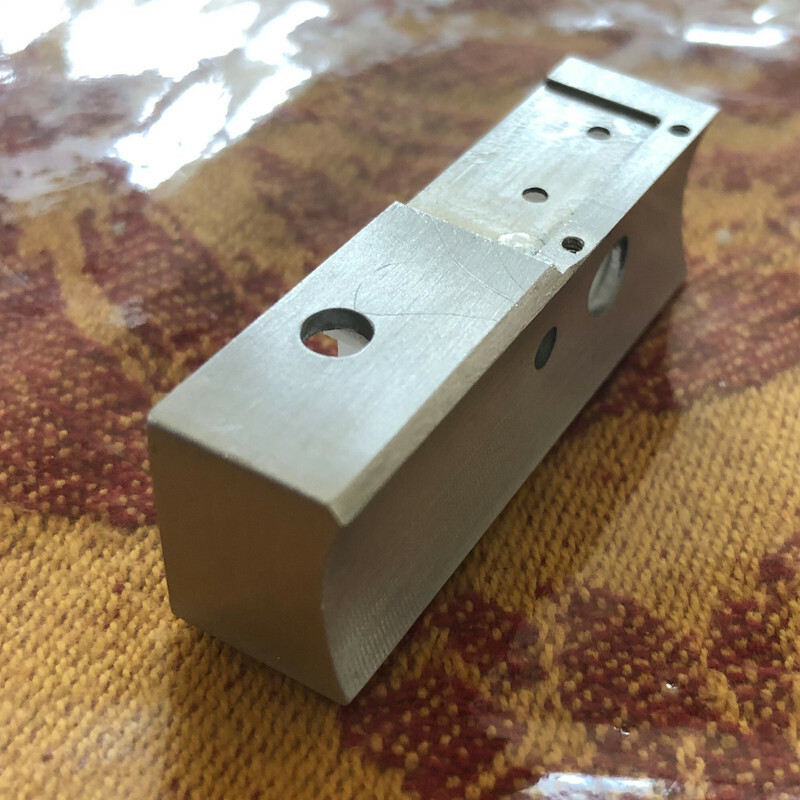 Lastly, the the pommel cap appears to be .5mm too long as well... but this could be machined to the correct length as there is PLENTY of meat in the end cap. I didn't take the depth of the grenade rings but I can say that there is a little variance... they should not all be the exact same depth like the PP/7Ch is. The PP/7Ch depth is also a bit fatter... which I think you can see. Actual should be a minimum diameter of 26mm average. 33 max. The PP/7Ch has a 34mm OD max and a minimum of 29.35. That may be to help with durability in the FX department since the ID of the grenade is 25.5 mm... I wouldn't machine it to accurate depth unless you plan to keep it on a shelf. So.. all of this is based off of the 27mm saber we got... which Lewis stated is source said was correct. I still think that is hooey. The image above from Lucasfilm Archive's book states 29mm. The ANH Obi wan replicas have verified length. The V2s now have a verified length of 29 mm... I don't know why production would choose to make another saber (which they had been for years based off the Obi Hero) and choose to make it 2 cm different. See here... I printed another version of the Lucasfilm Archive image sized at 29mm and held it alongside my Roman Props Ob1 and the Newest anakin starkiller V2. As you can see... the lineage lines up. the 1.6 flathead screws are a perfect match. Making this prop... I can only imagine they would use a readily available screw... as these flatheads are. If PP/7Ch is going to provide a replacement grenade... but they said they anticipate making the section longer to account for the length issue: Doesn't this comparison indicate that it will make the grenade section TOO long? The proportions will be off in a different way. The rings might wind up looking better but that winds up being a bandaid for a larger issue. I hope the new grenade section is the exact same length based off of what I am seeing here... just with the correct ring shaping. brrogers I am going to mercilessly incorporate your pics and info into this. And your logic is sound. What I suspect happened is they based their models off the resin prop which is prone to shrinkage which would explain the reduction. And yes. I am super worried they will botch the "corrected ribs" and I will be left doing it myself anyway as you did. Guess my search for an ultimate canon FX RotJ Hero is not fulfilled just yet. However I can at least make this PP close after lots of mods. The water was cold! That's it! Lmao! Would be interesting to get a set of measurements like you did but for the 29cm like we suspect it should be...?